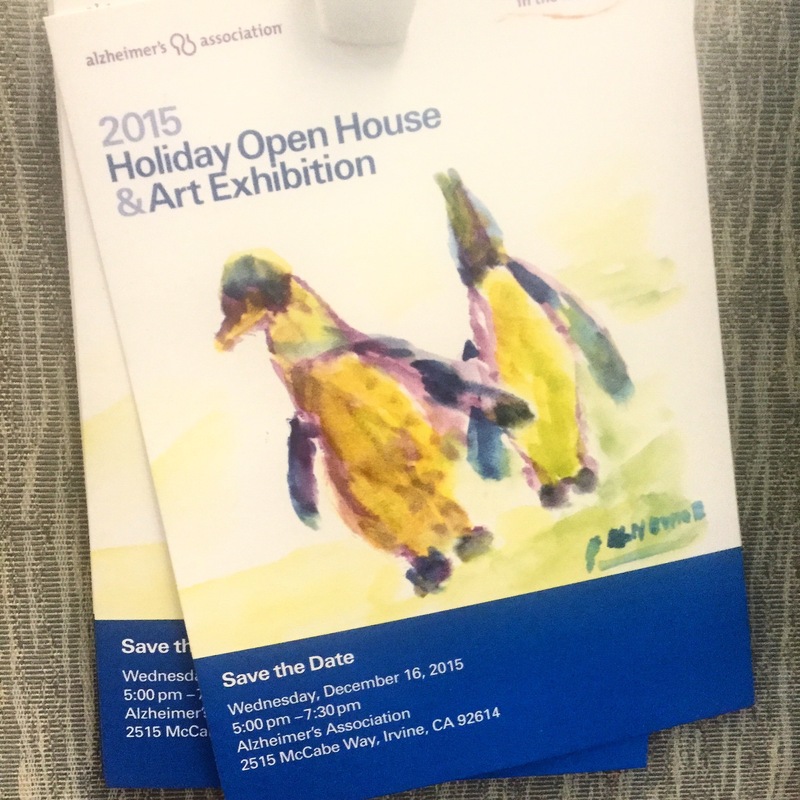 The 2015 Holiday Open House and Art Exhibition for Alzheimer’s Orange County is happening right now. Color and vibrancy are what drew my to Dr. Justin Call and Marilyn Clifford’s pieces. Their bold use of pigment fired memories of my own childhood and grandparents, igniting a creative response kindled by The Alzheimer’s Association, Orange County and the ideas of Memories in the Making. Walks with Grandfather and Talks with Grandmother began with similarities in subject and placement. Dr. Call’s vivid boats are reflected in Walks; Ms. Clifford’s Fall Leaves become a garden illuminated by sunset. Behind each primary image are the layered ghosts of memory, hand-drawn in wax, pencil and ink pen. These nostalgic images are from family history, triggered emotively by the original subjects. In Walks, early-morning, lakeside walks with grandfather are mingled with the image of him holding his grandson’s hand for the first time. The narrative around the images are thoughts and phrases from both grandfather and grandson. Talks began with the idea of grandmother’s garden and the colors of sunset. 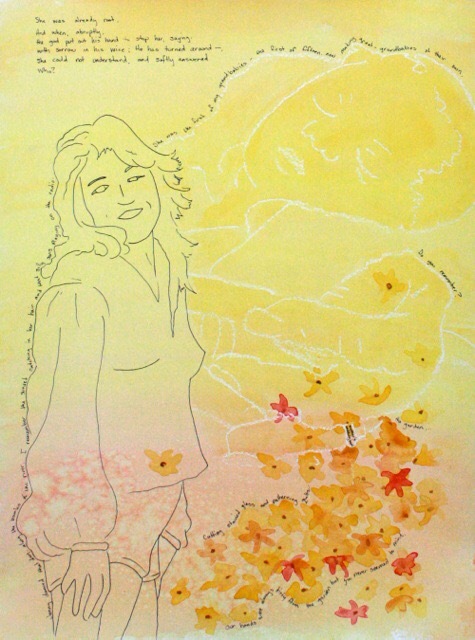 A favorite image of “Jenny” is drawn in ink beside the near hidden image of grandmother holding her granddaughter for the first time. As in Walks, the narrative of Talks mingles the thoughts and phrases of grandmother and grandson. Memories in the Making provides an opportunity to explore creativity and emotions through art. The struggle and stigma of Alzheimer’s can invoke fear. However, those affected, either directly or indirectly, are filled with as much richness and vitality as those who are not. I am honored to haveWalks with Grandfather and Talks with Grandmother as part of the growing legacy of the Memories in the Making program. These pieces reflect constructs of memory by emphasizing the vibrancy of now. Like the lines of poetry, the paintings, though concerned with ideas of memory, are simply constructs upon the present. 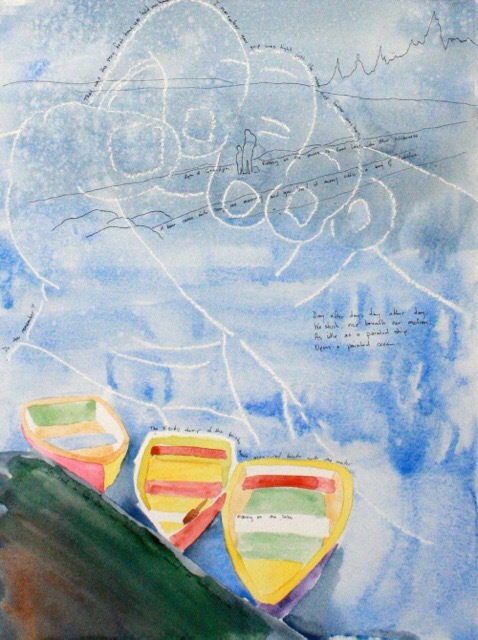 Walks with Grandfather and Talks with Grandmother are watercolor, wax crayon and sharpie pen on 140lb paper. Each painting is 18 x 24 inches.